This week I was lucky enough to receive a complementary copy of the newly released magazine ‘The Art of Knitting‘. 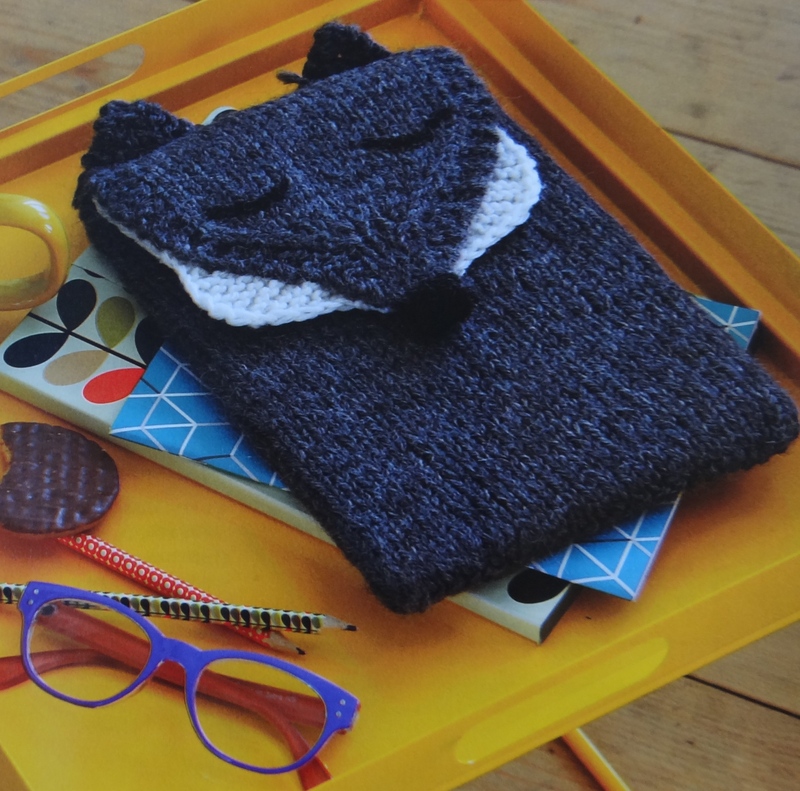 The Art of Knitting is a weekly publication with everything you need to get started on your very own knitting adventure. 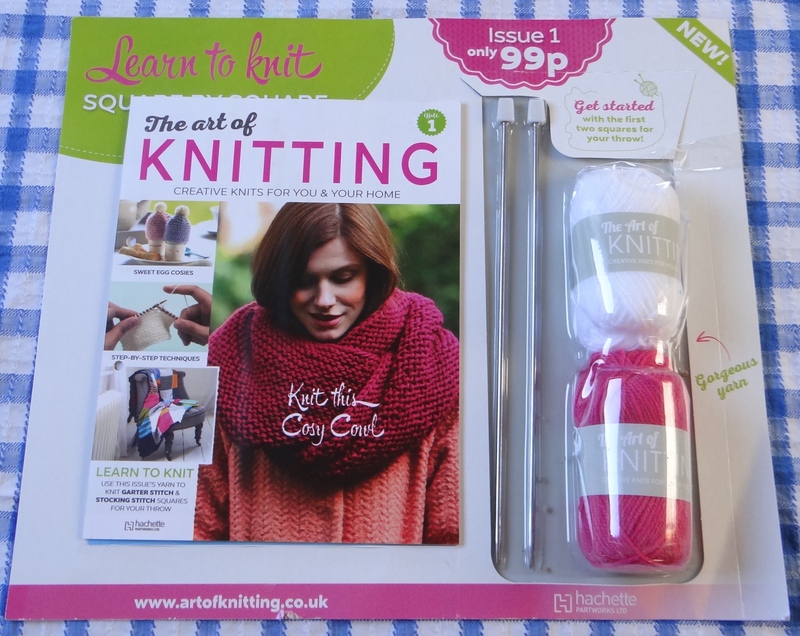 Issue 1 is reduced to 99p (general subscription price £2.99) and comes with 2 x 25g balls of acrylic yarn (white and lipstick shades) and a pair of metal 4mm knitting needles to create the first two squares for a throw. Here’s how mine turned out! The magazine contains well presented stitch guides, an example is shown in the photo below. For those who want more detailed instructions you can either check out my earlier blog posts or watch a tutorial e.g ‘How to make a Slip Knot’ over on The Art of Knitting blog. 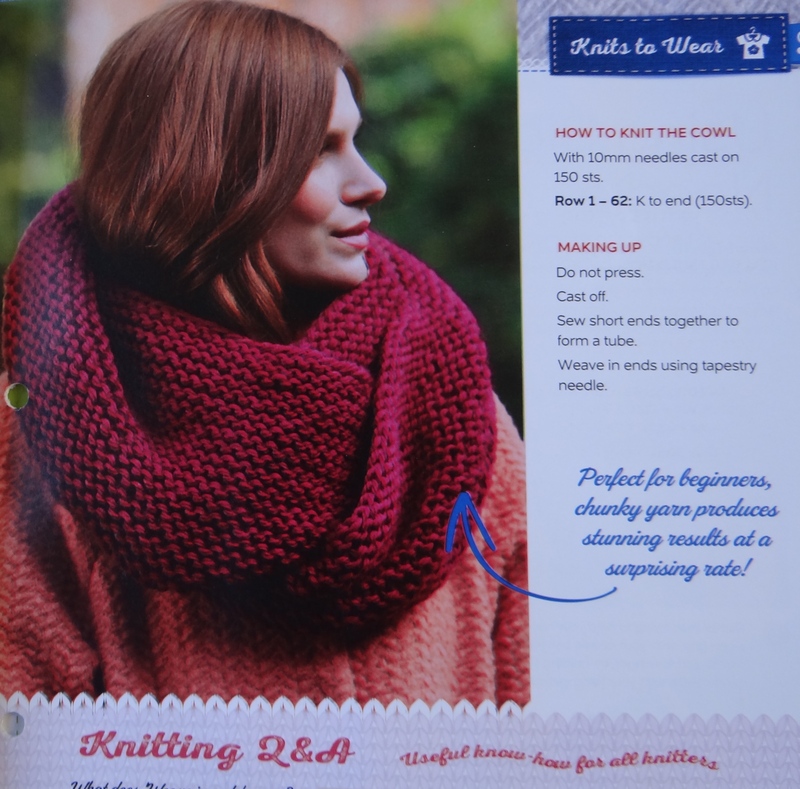 Inside Issue 1 there are a selection of patterns which are good for beginners and those who have already begun to develop their knitting skills. For example, this snuggly Cowl is made from a rectangle of garter (knit) stitch. 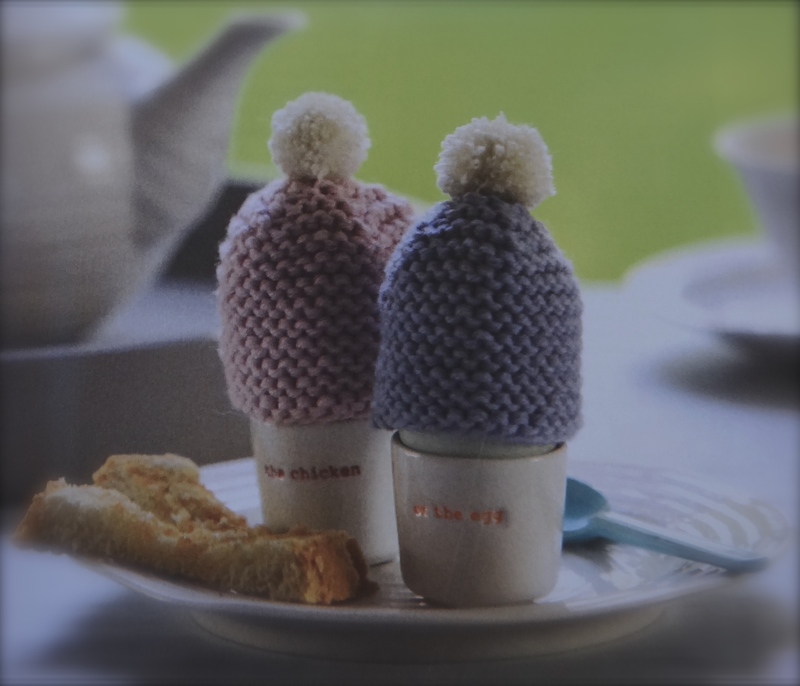 The Egg Cosy garter stitch pattern encourages folk to master the art of decreasing……. ….and for those who are competent with double-pointed needles and ‘working-in-the-round’ (something I have yet to conquer!) there is a very cute Wolf iPad Case. 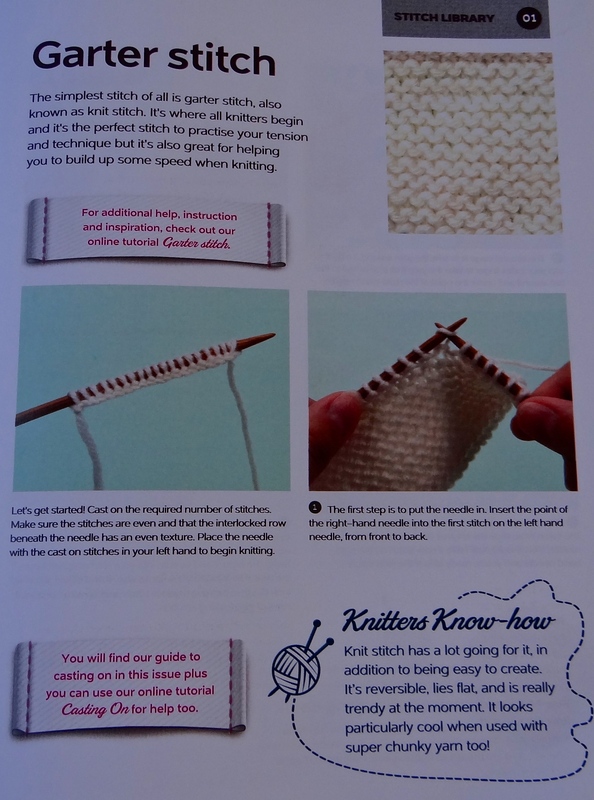 The publication is clear and well presented throughout with some really useful knitting tips. The patterns appear to be up-to-date and cover a range of things to wear and create for the home which is always good when you want to want a project that doesn’t take forever to finish. If you have had the chance to check out this magazine I would love to know what you think. Would you recommend it and if so, who to? 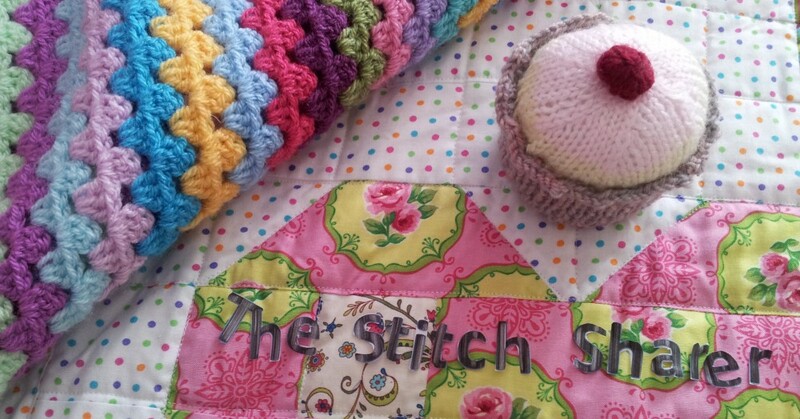 For me – I think it’s a great idea how the ‘Art of Knitting’ encourages newbies to learn a new stitch each week as they create the squares for the throw / blanket. Just imagine how big it could get as their confidence grows! 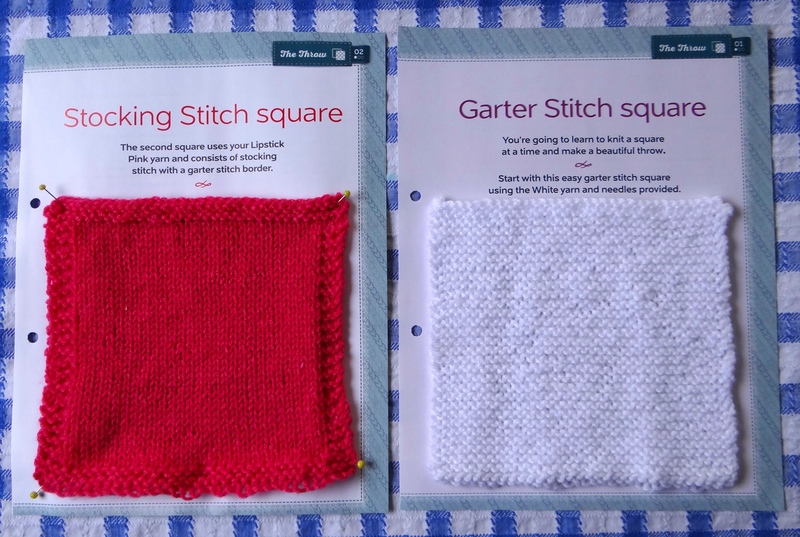 This entry was posted in Beginner, How to guide, Knitting, Stitching and tagged knitting, Magazine review independent; The Art of Knitting Magazine; The Stitch Sharer by thestitchsharer. Bookmark the permalink. I’ve recently subscribed to this and I think it’s brilliant! I’ve been knitting for quite a while learning through youtube and other sources but mostly self taught. I’m only up to about issue 8 and I’m picking up alot of cool tricks from them. As a subscription I pay about $34 au probably once a month and generally get 3-4 issues with each delivery plus the little gifts for subscribing. It really is a fantasic and easy to comprehend series. Can’t wait to have my throw at the end of it!! How many issues is there of the art of knitting I have up to nr12. That sounds like a good plan, otherwise you could try and use bigger size knitting needles. Do anyone have contact details for back issues, I have missed No 5. I have missed issue No5. Where do I obtain a copy please? where can these be found? who stocks these? If you are in the UK most of the big supermarket stock the magazine – my friend found hers in Tesco. Otherwise WHSmiths might have some. Otherwise I think you can subscribe via their website. Hope this helps. love this mag, I am knitting the I pad cover for my daughter but find the very first instructions confusing. do I use double ended needles or knit in the round and is the needle size correct – seems a bit big , 6.5 ? maybe it is me but I am at work at the moment and do not have it before me, just know I felt it didn’t read properly .Thanks. Will certainly buy future copies. How did the wold go, I think I found an error on the flap, following the patterens seems to have the back side of stocking stitch as the wolfs head 😦 have you found this, or have I made an error in reading the pattern? I haven’t had the chance to make the wolf case yet – can you add an extra row of stocking stitch in? Did you want to email the magazine editor to see if they have any more feedback? Here’s the link to their contact page, there is a phone number there for questions and form on it which you can use to email. Thanks for the update, hopefully the magazine website is carrying the amendments. I brought the first edition in my local newsagent. I completely agree with your review. The guides are fantastic. I started my white square last night. They have great accompanying video tutorials on their website. I’ve been wanting to learn some more stitches for ages and this will be the thing to do it. They also have a great list of free gifts if you subscribe! I’ve just found out that this is out again. I’m hoping to find it locally as I want to put the yarn and needles in my Christmas shoeboxes and I couldn’t get them for less than 99p elsewhere. I think magazines are great for ideas – I have written projects for them myself. This looks a great source of information and skill building. I admire you for creating your squares, I admit I am too impatient and simply jump in.